Nice job, good looking thread! Today I thought I'd try a new experiment with this tag sale sander. 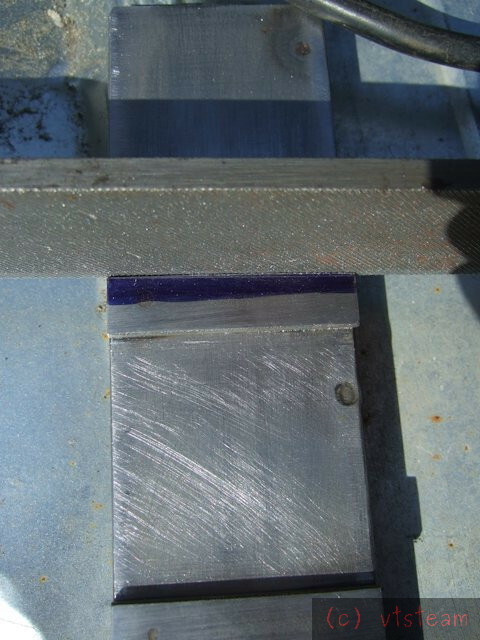 First step was to blue up one of the slide pieces, and mark a line 1-1/2 degrees off square. I decided to do this using a little math since that's a pretty small angle to mark with a protractor. Then I started filing to the line. I could have milled it, but I don't have a rotary table, and by the time I set up the mill and got that heavy vise over to 1-1/2 degrees, set the cutter height and did edge finding, etc.....well it was a lot quicker and easier to just file it to the line. I might have spent 5 minutes total -- and it was nice doing it outside in the sun on this unusually cool day. I bought a barrel of aluminum scrap at an auction once, and there were a lot of one inch square bar cutoffs -- maybe from a screw machine room. 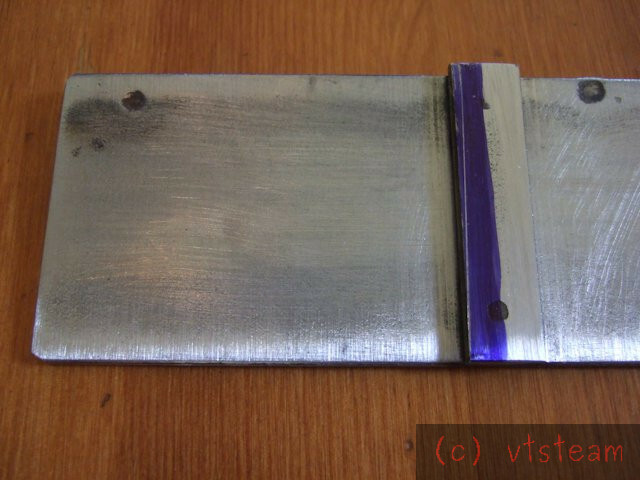 I took one of the aluminum blocks and another strip of 1/8" by 1/2" steel, and positioned them to space the new strip an inch away from the one I just filed, and parallel with it. 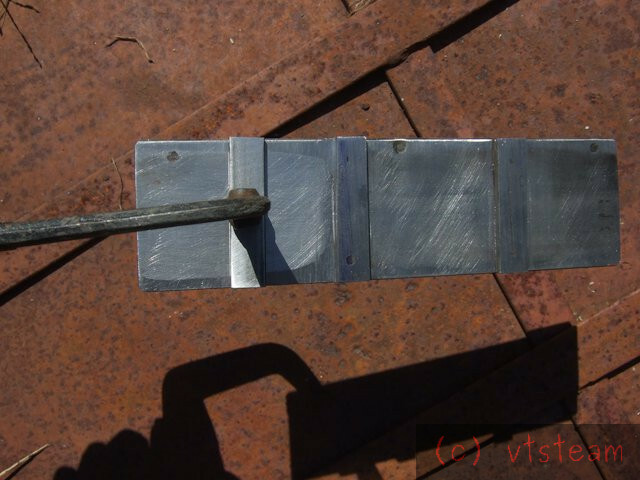 I clamped the steel strip down with a welder's clamp. 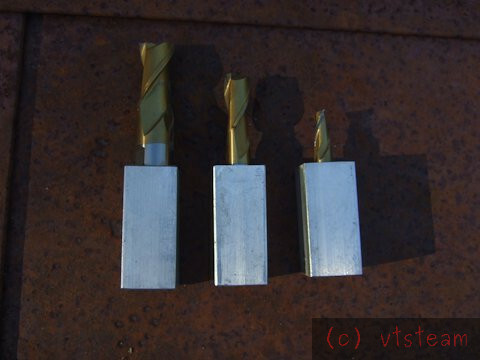 Then I took three of the aluminum cutoffs and faced, drilled, and reamed 3/8", 1/2" and 3/4" to fit some end mills. And for longer mills, I can turn the slide around so it is on the other side of the sander's table slot. The 1-1/2 degree relief angle stays in the same orientation, either way. 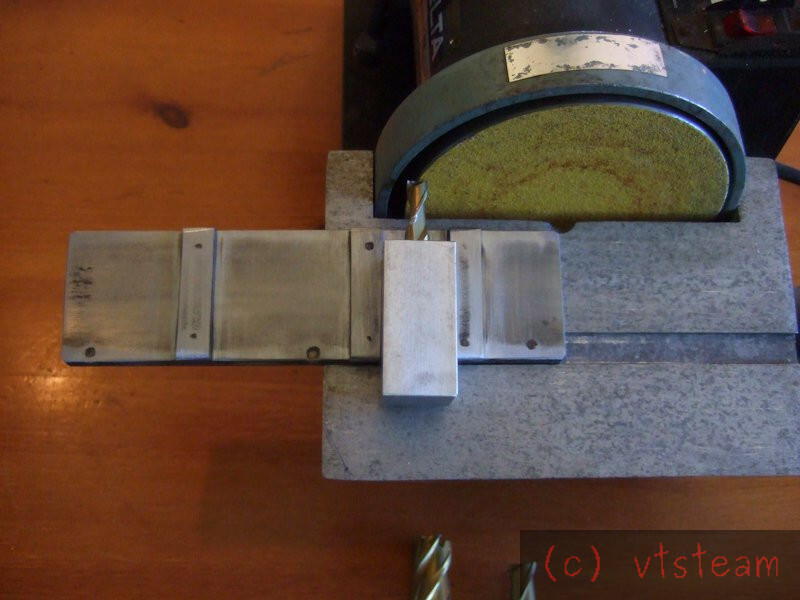 The blocks can be rotated 90 degrees and replaced in their slide to sharpen each of 2 or 4 flutes. 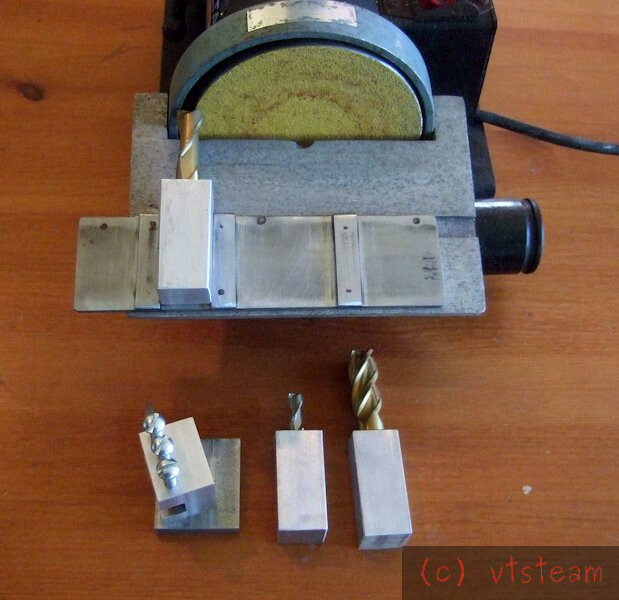 Tomorrow I will work on a stop, a slide clamp and the adjustment method, and I hope, sharpen an end mill. I have a big box of used mills that someone gave me, so that would be kind of nice! 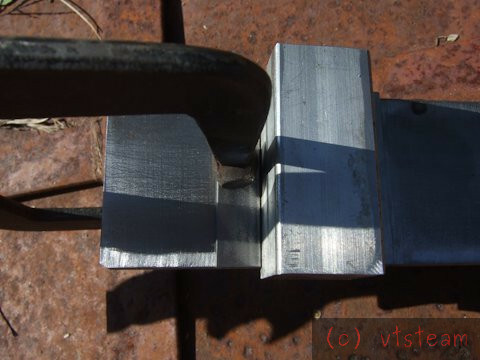 And finally for today, here's what it looks like with the lathe tool sharpening jig in place. That's pretty good looking. I can see that you are going to have a good supply of sharp bits to choose from. It appears to have worked out well for you without breaking the bank. Thanks for allowing us all to look over your shoulder while you work. Thank you Don, and also Arbalist -- sorry I missed your post earlier. Well spotted Boriss. 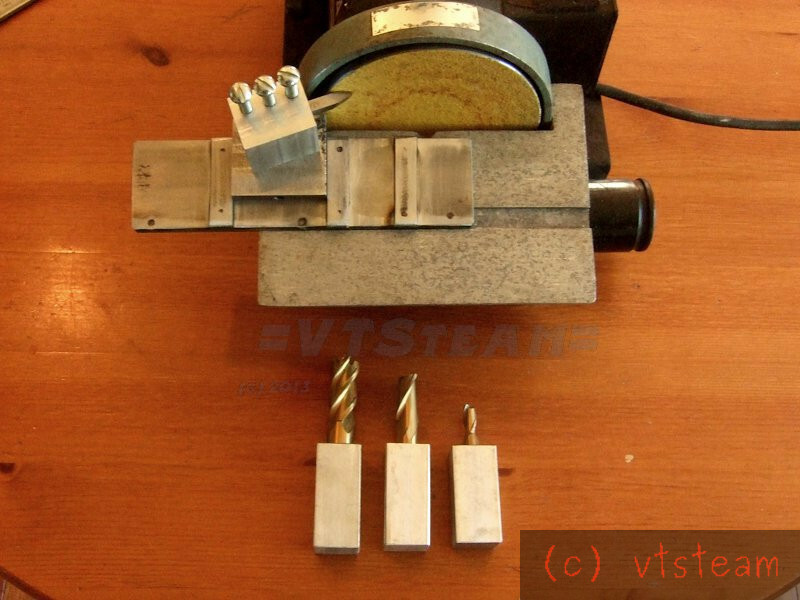 Yes the table tilts, and will be set to the proper angle(s) when it comes time to sharpen a test mill. I just left it at the angle I had used for the lathe tool when I took the photos. There's more to do before I try it out. Thanks for responding! Restored photos after Photobucket links were broken. Thanks for restoring the photo links for this project. 2013 and still relevant. Only problem I have is that it has added to my ever expanding "Things to make" list. Supposed to be 41C here tomorrow so no playpen time for this little chappy unless I can sneak out for a bit early morning. Excellent Steve. Photobucket has a lot to answer for in wrecking tens of thousands of informative threads across many forums on the web. I hope that they feel any gain to them outweighs the enormous loss of reputation I sincerely hope they suffer. -16C here today and that will be the high, John, -27C Saturday predicted, so I can tell we're on opposite sides of the world, and neither of us in the shed! Andrew, will restore all my threads in the evenings gradually. It's kinda fun to revisit old stuff, actually, for me. Gets me back interested in doing things in the shop -- had a lapse in interest for awhile. Well I did manage an hour or so, until the temp in the playpen got to 32C. In the house it was 27 so felt really good when I came in. The thermometer under the lemon tree said 43C a few minutes ago so I'm glad to be inside even if we did finally put the Air-Con on. Amazing with all the new technology now, we know stuff all over the globe within an hour of it happening. Unlike when we were lads when the "news" would take days to make it down under. I agree it is good to revisit some older posts and some of them seem new - cos I forget em. So, you stay warm, I'll stay cool as the air-con keeps working. I must say right on time. I have a nice belt/disc sander and the disc just sits there spinning because I use my pedestal grinder to do my tool grinding. But using the disc I can cut more precise settings much easier. Thanks for the update and show up on my radar. I'll be using your ideas to make it work for me. Thank you Sir, by the way I like the way you think.